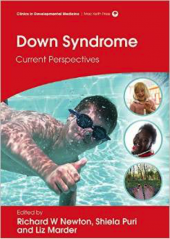 Down Syndrome results in a reduction in brain growth and development. Children’s development is affected by low muscle tone, poor motor coordination, and slower processing of information, resulting in delay in acquiring skills. Attention span is often short, and poor auditory memory contributes to language delay. Developmental Disorders such as ADHD and Autism are more common in children with Down Syndrome, but may present and be diagnosed later. Epilepsy is more common in Down Syndrome, with presentation most likely in infancy, or in adults over 30 years of age. Infantile spasms, or West syndrome, present between 5 – 15 months of age. Generalised seizures may present in later childhood. In adults, onset of absence epilepsy may be an early sign of dementia. Deterioration in walking or bowel or bladder control may be a sign of cervical spine instability affecting the spinal cord and needs urgent investigation and management. Regression in skills and emotional and behavioural withdrawal in adolescence may be due to many causes including hypothyroidism, deterioration in vision or hearing, depression, or other difficulties such as Catatonia. Stroke is rare in Down Syndrome, but if it occurs, underlying causes such as heart disease (SBE), or Moya-Moya syndrome which is a progressive condition must be considered.